Bridesmaids fits easily into my list of "top 60 funniest movies" of all time, all of which are five-star classics. The thing that stands out about it is that a buddy-girl film like this has never been attempted, or at least has never worked. Kristen Wiig shines with all the promise she has displayed in recent years on Saturday Night Live, but never fully captured at the box office. Wiig plays the maid of honor who just isn't very good at wedding planning. The best scenes happen when the girls disgustingly pick out their wedding dresses, take a messy flight to their Vegas bachelorette party, and are entertained at Maya Rudolph's wedding by a certain female trio from the 90s. 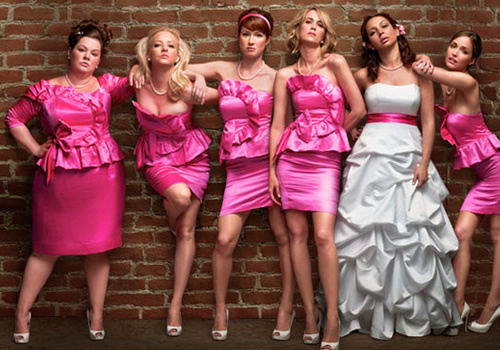 Melissa McCarthy as Megan is a highlight as the chunky and spunky sister of the groom. She's full of bad ideas, like when she flirts in flight with an air marshall (played by her real-life husband). Jon Hamm, Mad Men's Don Draper, is also delectable in a different kind of sleazy way from his TV character.